A 3¼ mile circular walk around Surbiton with a 3 mile extension to Thames Ditton. Surbiton is 'leafy suburbia' with a number of conservation areas. Many buildings date from its periods of growth with the arrival of the railway and the inter-war years. The railway located to its present site in 1838. The current station building was designed by J Robb Scott in 1937. Early houses in Victoria Road were converted to commercial use around 1870. The station and properties opposite are listed buildings. Further along a former post office of 1898 is now Zizzi. There are transport murals on the Sainsbury store. Left into Upper Brighton Road, right at Lovelace Road then left along Corkran Road. This area has large detached houses from the 1860s to 1930s. Right at Woodlands Road then left along Ashcombe Avenue. Left along Langley Avenue. At the junction cross and go right along Kingsdowne Road. At the end is St Matthews Church. There are five late 19th century detached villas in Gothic style on the left. This has mature trees, ponds, streams and steep banks with dense hedging along the boundaries. The area was used for the extraction of brick earth and the manufacture of bricks. Follow the path bearing left past a pond and towards the house. The original mid 18th century house was much altered in the 19th century. The terraced artisans cottages were built on former brickfields in the late 19th century. Left at Browns Road then right into Ewell Road. Bank Buildings of 1904 are opposite. Surbiton New Life Church and Gothic house opposite. Entrance to former Berryland Dairy (1840). The Surbiton Hospital site has been redeveloped to provide new healthcare facilities and a school. Methodist Church and former school. Beyond this are civic buildings from the inter-war years; fire station (1931), library halls with war memorial, library, Crown Court and Telephone Exchange. Behind the war memorial is a cairn made of stones from St Mark's Church, bombed in October 1940. Opposite the fire station detour into South Bank to view Hillcroft College. This was built as The Gables for Wilberforce Bryant (of Bryant & May matches) in 1884. Return and after crossing the railway continue down Surbiton Hill Road (on the right hand side). St Mark's Church, visable to the left, was destroyed in WWII except for the tower and rebuilt in 1960. Hollyfield School occupies attractive buildings. Hexagon House is used by the Freemasons. At the road junction the former assembly rooms are now part of Surbiton High School. They were designed in 1882 by A Mason. Claremont Hall is now used as a nursery. This area with The Cresent and its gardens was developed from 1838. 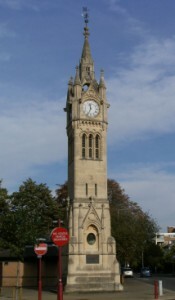 At the end of the gardens is the listed Clock Tower of 1905-8 which commemorates the coronation of Edward VII in 1902. The buildings on the left have fine terracotta decoration. The Coronation Hall, opened in June 1911 as a lecture hall was later a cinema then used for bingo. It is now a Wetherspoons pub. Cross to the station or to continue the walk go along St James' Road opposite this. The Surbiton Club. Claremont Cottage Hospital opened in 1883. It was replaced by the WW1 Memorial Hospital in Ewell Road but this was not opened until 1936. The Claremont buildings remained in medical use until 1977 but have now been converted to apartments. This area was developed in the 1860s-1880s in Gothic and Italianate styles. St Andrews Church was designed by A W Blomfield in 1871. The garden square is unique to SW London. Notice the cottages in Seething Wells Lane. The waterworks moved upstream from Chelsea in 1856. On the left the buildings have been converted to health and residental use. On the right are the remains of filter beds and the current Thames Water premises [wikipedia article]. Beyond these is the Thames Marina. Right at Ditton Reach then go left through the grass area. Left at Ferry Road. Stoneleigh House was once the police station and is said to retain its cell block. Continue along Portsmouth Road to the right then right at Giggs Hill Road alongside the green. St Leonards Cottages were formed from a former late 18th century stable block. The clinic and library are modern buildings. Further along is Cooper Hall & Cottage (left) and Byways and Rose Cottage (right). Continue along the High Street. The old slaughterhouse dates back to c1580 and was used by the Royal deer catcher 1860-1921. This and the home of Cesear Picton have plaques. Picton (a black boy) was brought from Senegal and presented to Sir John Philips. A legacy enabled him to set up in business as a coal merchant in Kingston. He retired to Thames Ditton and died in 1836 aged 81. The Home of Compassion consists of a main house (built as Boyle Farm in 1792), a former chapel and a priory. The premises are being redeveloped as a private care home. Ye Olde Swan pub was formed from two houses, linked and extended. Alongside is a footbridge to Thames Ditton Island (no public access). Ferry Works are now industrial units but were occupied by AC Cars 1911-29. A former foundry opposite operated until the 1970s and produced famous pieces including the Peace Quadriga on Wellington arch. Return and take the path to the church. Continue along Church Walk then detour right into Speer Road to view the former school. The United Reformed Church is in an unusual style. Detour left into Station Road to view Henry Bridges almshouses. These 6 one bedroom cottages were built in 1720 and restored in 1925 and 1977 (see plaques). Return to the crossroads to access Thames Ditton Station. Conservation area documents for Surbiton [click here] Areas: 3, 4, 8, 10, 19, 26 are relevant. Page 5 has a map and photos. Conservation area studies for Surbiton [click here] Select area on left for further documents including OS maps.